This article is about the metropolitan area of Townsville. 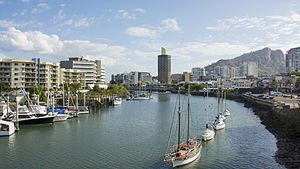 For the Townsville CBD suburb, see Townsville City, Queensland. For the local government area, see City of Townsville. For other uses, see Townsville (disambiguation). Popular attractions include "The Strand", a long tropical beach and garden strip; Riverway, a riverfront parkland attraction located on the banks of Ross River; Reef HQ, a large tropical aquarium holding many of the Great Barrier Reef's native flora and fauna; the Museum of Tropical Queensland, built around a display of relics from the sunken British warship HMS Pandora; Castle Hill or as it was originally known Cootharinga, the most prominent landmark of the area and a popular place for exercise; The Townsville Sports Reserve; and Magnetic Island, a large neighbouring island, the vast majority of which is national park. Such indigenous groups as the Wulgurukaba, Bindal, Girrugubba, Warakamai and Nawagi, among others, originally inhabited the Townsville area. The Wulgurukaba claim to be the traditional owner of the Townsville city area; the Bindal had a claim struck out by the Federal Court of Australia in 2005. James Cook visited the Townsville region on his first voyage to Australia in 1770, but did not actually land there. Cook named nearby Cape Cleveland, Cleveland Bay and Magnetic(al) Island. In 1819, Captain Phillip Parker King and botanist Alan Cunningham were the first Europeans to record a local landing. In 1846, James Morrill was shipwrecked from the Peruvian, living in the Townsville area among the Bindal people for 17 years before being found by white men and returned to Brisbane. The Burdekin River's seasonal flooding made the establishment of a seaport north of the river essential to the nascent inland cattle industry. John Melton Black of Woodstock Station, an employee of Sydney entrepreneur and businessman Robert Towns, dispatched Andrew Ball, Mark Watt Reid and a detachment of 8 troopers of the Native Police under the command of John Marlow to search for a suitable site. Ball's party reached the Ross Creek in April 1864 and established a camp below the rocky spur of Melton Hill, near the present Customs House on The Strand. Edward Kennedy, a member of the surveying party, recalls the Native Police chasing local tribesmen into the ocean and 'pumping lead' at them. On the return journey to Port Denison, the group 'dispersed' another aboriginal clan, rounding up fifteen women 'who remained at the scene of combat' and abducted them back to the barracks. No mention is made of the fate of any children. The first party of settlers, led by W. A. Ross, arrived at Cleveland Bay from Woodstock Station on 5 November of that year. In 1866 Robert Towns visited for three days, his first and only visit. He agreed to provide ongoing financial assistance to the new settlement and Townsville was named in his honour. Townsville was declared a municipality in February 1866, with John Melton Black elected as its first Mayor. Townsville developed rapidly as the major port and service centre for the Cape River, Gilbert, Ravenswood, Etheridge and Charters Towers goldfields. Regional pastoral and sugar industries also expanded and flourished. Townsville's population was 4,000 people in 1882 and grew to 13,000 by 1891. In 1901 Lord Hopetoun made a goodwill tour of northern Australia and accepted an invitation to officially open Townsville's town hall, occasioning the first ever vice-regal ceremonial unfurling of the Australian national flag. With Brisbane, in 1902 Townsville was proclaimed a City under the Local Authorities Act. The foundation stone of the Townsville Cenotaph was laid in Strand Park on 19 July 1923. It was unveiled on 25 April 1924 (ANZAC Day) by the Queensland Governor, Sir Matthew Nathan. The rural land surrounding the city was initially managed by the Thuringowa Road Board, which eventually became the Shire of Thuringowa. The shire ceded land several times to support Townsville's expansion. In 1986 the Shire became incorporated as a city, governed by the Thuringowa City Council. The cities of Townsville and Thuringowa were amalgamated into the "new" Townsville City Council in March 2008, as part of the Queensland state government's reform program. In 1896, Japan established its first Australian consulate in Townsville, primarily to serve some 4,000 Japanese workers who migrated to work in the sugar cane, turtle, trochus, beche de mer, and pearling industries. With the introduction of the White Australia policy, the demand for Japanese workers decreased, causing the consulate to finally close in 1908. A statue of Robert Towns was placed in Flinders Square in recognition of his contribution to the establishment of Townsville. During the Second World War, the city was host to more than 50,000 American and Australian troops and air crew, and it became a major staging point for battles in the South West Pacific. A large United States Armed Forces contingent supported the war effort from seven airfields and other bases around the city and in the region. The first bombing raid on Rabaul, in Papua New Guinea, on 23 February 1942 was carried out by six B-17s based near Townsville. In July 1942, three small Japanese air raids were conducted against Townsville, which was by then the most important air base in Australia. Several 500-pound (230-kilogram) bombs were dropped in the harbour, near the Garbutt airfield and at Oonoonba, where bomb craters are still clearly visible. No lives were lost and structural damage was minimal, as the Japanese missed their intended target of the railway and destroyed a palm tree. Although the Japanese aircraft were intercepted on two of the three raids, no Japanese planes were shot down. In 1961 the university of Queensland established a campus at Pimlico, near Pimlico State High School, later developing a site at Douglas near the Army Barracks, and across the new Nathan Street Bridge. The faculties of Arts, Law, and Education, and several residential colleges, Union, St Mark's, and John Flynn relocated from central Townsville. This was followed by the relocation of St Raphael's college for women. A large modernist building was established. In 1971 Cyclone Althea with flooding slowed progress of infrastructural building, but by 1972 James Cook University was established, with ecru academic gowns, quite different to those of older universities. From 1961, only the first years of studies for Medicine and for Veterinary Sciences were offered in Townsville, but the establishment of a new General Hospital at Mount Louisa provided facilities necessary for the establishment of an independent Medical School. On Christmas Eve 1971, Tropical Cyclone Althea, a category 4 cyclone, battered the city and Magnetic Island, causing considerable damage. In 1973, Indigenous activists Eddie and Bonita Mabo established the Black Community School in Townsville, where children could learn their Indigenous culture rather than white culture. Eddie Mabo worked as a gardener at James Cook University in the 1970s and 1980s. It was at the university in 1974 that he first learned of the implications of the terra nullius doctrine that meant he did not legally own the land he believed was his under the traditional land inheritance system of his people. Alexandra Hotel, a significant hotel on Flinders Street, was lost to demolition in the 1970s. Buchanan's Hotel in Flinders Street was regarded by architectural historians as Australia's most significant building in the Filigree style was lost to fire in 1982. In 1981 a land rights conference was held at James Cook University and Eddie Mabo made a speech to the audience where he explained the land inheritance system on Murray Island. The significance of this in terms of Australian common law doctrine was taken note of by one of the attendees, a lawyer, who suggested there should be a test case to claim land rights through the court system. Mabo decided to take on the Australian Government. Perth-based solicitor Greg McIntyre was at the conference and agreed to take the case; he then recruited barristers Ron Castan and Bryan Keon-Cohen. McIntyre represented Mabo during the hearings. The James Cook University Douglas campus library is now named after Mabo. On 3 June 1992 the High Court of Australia ruled in favour of Eddie Mabo in Mabo v Queensland (No 2) recognising native title in Australia for the first time. In 1993 the New South Wales Rugby League announced that a team from Townsville would be admitted to the expanded, nation-wide competition, and the North Queensland Cowboys made their debut in the 1995 ARL season. In October 2000, a Solomon Islands Peace Agreement was negotiated in Townsville. Inner city high-density development has also created population growth and gentrification of the central business district (CBD). One significant contributor to CBD development was the construction of a new rail passenger terminal and re-siting of the railway workshops, releasing prime real estate which formerly belonged to Queensland Rail for the development of residential units, retail projects and a new performing arts centre. The skyline of Townsville's central business district has undergone dramatic changes over the last few years, with a number of new highrise buildings, both commercial and residential, constructed. In the short term, much of the urban expansion will continue to the west and the north, in the former City of Thuringowa. The most significant of these is North Shore Estate, a new A$1 billion 5,000-lot housing estate, located close to the Bruce Highway, just north of the Bohle River. Medium term expansion of the city will be focused on two major urban developments that have started in 2017/18. Elliot Springs, a satellite city to the south of Townsville developed by national developer Lendlease Group, is expected to be home to 26,000 people by 2057. Additionally, the Queensland Government announced it will be offering 270 hectares (670 acres) of State-owned land (the former abattoir reserve), just south of the Bohle River, for urban expansion. Townsville lies approximately 1,350 kilometres (840 mi) north of Brisbane, and 350 kilometres (220 mi) south of Cairns. It lies on the shores of Cleveland Bay, protected to some degree from the predominantly south-east weather. Cleveland Bay is mostly shallow inshore, with several large beaches and continually shifting sand bars. Magnetic Island lies 8 kilometres (5 mi) offshore, to the north of the city centre. The Ross River flows through the city. Three weirs, fish stocking and dredging of the river in these reaches has resulted in a deep, stable and clean waterway used for many recreational activities such as waterskiing, fishing and rowing. Thirty kilometres from the mouth (at the junction of Five Head Creek) is the Ross River Dam, the major water storage for the urban areas. The historic waterfront on Ross Creek, site of the original wharves and port facilities, has some old buildings mixed with the later modern skyline. However, the central city is dominated by the mass of red granite of Castle Hill, 286 metres (938 ft) high. There is a lookout at the summit giving panoramic views of the city and its suburbs, including Cleveland Bay and Magnetic Island. There are a number of parks scattered throughout the city, including three botanical gardens — Anderson Park, Queens Gardens and The Palmetum. Townsville is characterised as a tropical savanna climate (Köppen climate classification Aw). Owing to a quirk of geographical location, Townsville's winter rainfall in particular is not as high as elsewhere in the eastern coastal tropics of Queensland, such as Cairns. The winter months are dominated by southeast trade winds and mostly fine weather. Further north the coastline runs north/south and the trade winds are lifted to produce rainfall right through the year. Townsville, however, lies on a section of coastline that turns east/west, so the lifting effect is not present. As a result, winter months are dominated by blue skies, warm days and cool nights, although at times significant rainfall may occur. The average annual rainfall is 1,143 millimetres (45.00 in) on an average 91 rain days, most of which falls during the six-month "wet season" from November to April. Because of the "hit or miss" nature of tropical lows and thunderstorms, and the powerful influence of the El Niño–Southern Oscillation, variation from year to year is almost uniquely large for so wet a climate, being comparable only to a few cities in the Brazilian Nordeste (e.g. Fortaleza). Since records at various urban locations started in 1871 twelve-month rainfalls in Townsville have ranged from a mere 217.9 millimetres (8.58 in) between December 1901 and November 1902 at the peak of the Federation Drought, to as much as 2,956.2 millimetres (116.39 in) between March 1990 and February 1991. On average, the driest year in ten can expect only half the mean rainfall, compared to around 64 percent in Brisbane, 68 percent in Sydney, and 72 percent in Darwin. Rainfall also varies considerably within the metropolitan area; it typically ranges from 1,136 millimetres (44.7 in) at central Townsville City to 853 millimetres (33.6 in) at Woodstock, a southwestern suburb. The wettest 24 hours on record was 11 January 1998, with 548.8 millimetres (21.61 in) falling mostly in a 12-hour period after dark, which has since been dubbed the "Night of Noah" by Townsville residents. December is the warmest month of the year with daily mean maximum and minimum temperatures being 31.5 °C (88.7 °F) and 24.1 °C (75.4 °F) respectively. July is the coolest month with daily mean maximum and minimum temperatures being 25.1 °C (77.2 °F) and 13.7 °C (56.7 °F). Townsville experiences an annual mean of 8.5 hours of sunshine per day, averaging 120.8 clear days per year. Like most of Northern Australia, Townsville is susceptible to tropical cyclones. They usually occur between December and April, forming mainly out in the Coral Sea, and usually tracking west to the coast. Notable cyclones to affect the Townsville Region have been: Cyclone Yasi (2011), Cyclone Tessi (2000), Cyclone Sid (1998, in particular damaging The Strand and causing major flooding), Cyclone Joy (1990), Cyclone Althea (1971), Cyclone Leonta (1903), and Cyclone Sigma (1896). The city was also affected by the 2019 Townsville flood, the convergence of a monsoon and a slow-moving tropical low. Townsville has offices of many State and Federal Government agencies, such as Centrelink and the Australian Taxation Office. Townsville is governed by a City Council, comprising an independently elected Mayor and 10 Councillors who each represent a separate division within the local government area. Following local government reform undertaken by the Government of Queensland prior to the March 2008 elections, the previous entities of NQ Water, The City of Townsville and the City of Thuringowa were amalgamated. The Mayor of Townsville is Jenny Hill, a member of the Labor Party. Hill was elected in April 2012, replacing the retiring Les Tyrell and defeating main opposing candidate Dale Last. Tyrell was the immediate past Mayor for 17 years of the former local government authority, the City of Thuringowa. The previous Mayor of Townsville for 19 years was Tony Mooney (Australian Labor Party). Hill faced a largely hostile chamber in her first term, with 'Townsville First' candidates winning the majority of divisions. When local government elections were held in March 2016, Jenny Hill was re-elected as Mayor of Townsville while all ten of her Team Jenny Hill candidates (which included two sitting councillors) won in their respective divisions. The majority of the population of Townsville is represented in the Australian House of Representatives by Cathy O'Toole of the Australian Labor Party, first elected as the member for the Division of Herbert at the 2016 federal election. Historically a swinging seat, it is only held by a small margin. Some of the suburbs on the southern fringe of the urban area are part of the Division of Dawson and are represented by George Christensen, representing the Liberal National Party. Christensen is based in Mackay, about 400 kilometres (250 mi) south of Townsville, but he has a part-time office in Wulguru. Some of the northern suburbs of Townsville, known collectively as the "Northern Beaches", are included in the Division of Kennedy which is represented by Bob Katter (Katter's Australian Party), who is based in Mount Isa about 900 kilometres (560 mi) west of Townsville. Ian Macdonald (Liberal National Party), who is one of twelve Senators elected by Queensland to the Australian Senate, is based in Townsville. The city has a diverse economy with strengths in education, healthcare, retail, construction and manufacturing. It is a defense hub and is home to thousands of military personnel. It is also a major manufacturing and processing hub. Townsville is the only city globally to refine three different base metals — zinc, copper, and nickel — and it is planned in the near future to be home to a $2billion lithium-ion battery manufacturing facility developed by the Imperium3 consortium in partnership with Siemens. Nickel ore is imported from Indonesia, the Philippines and New Caledonia and processed at the Yabulu Nickel refinery, 30 kilometres (19 mi) north of the port. Zinc ore is transported by rail from the Cannington Mine, south of Cloncurry, for smelting at the Sun Metals refinery south of Townsville. Copper concentrate from the smelter at Mount Isa is also railed to Townsville for further refining at the copper refinery at Stuart.. The zinc refinery is one of the world's largest with an expansion from 2019. Townsville has several large public assets as a result of its relative position and population. These include the largest campus of the oldest university in northern Queensland, James Cook University, the Australian Institute of Marine Science headquarters, Great Barrier Reef Marine Park Authority, the large Army base at Lavarack Barracks, and RAAF Base Townsville. For a full list of suburbs in Townsville and the surrounding region, see List of Townsville suburbs. Townsville has a younger population than the Australian and Queensland averages. The city has traditionally experienced a high turnover of people, with the army base and government services bringing in many short to medium term workers. The region has also become popular with mine workers on fly in/fly out contracts. In 2005–06, the Townsville Statistical District grew at just over 3 per cent and was the fifth-fastest-growing district or division in Australia. Between 2000 and 2005 the annual average population growth in Townsville was 2.5%, compared with 2.2% for Queensland overall. However, growth has slowed in more recent years with population growth over the 2014–15 period being 1%, compared with the state average of 1.2%.As of 2018 growth is picking up again in part due to new infrastructure and industrial projects. There are over 60 private and State schools of primary and secondary education within the Townsville area. Townsville Grammar School is the oldest co-educational school on the Australian mainland. The Townsville State High School opened on 7 June 1924. James Cook University (JCU) is a public university based in Townsville. Established in 1970, the main campus is located in the suburb of Douglas. JCU was the second university in Queensland and the first in North Queensland. The University has a strong and internationally recognised expertise in marine & tropical biology. The JCU Medical School was established in 1999 and is linked with the adjacent tertiary-level Townsville Hospital. The Veterinary Sciences undergraduate facility is the newest in Australia. CQUniversity first established a presence in Townsville in 2014 with the opening of a Distance Education Study Centre in the CBD. The University quickly felt the demand for a face-to-face teaching presence in Townsville and has since opened a purpose built campus in the city offering many on-campus courses including Nursing, Paramedic Science, Business and Psychology as well as supporting growing numbers of online students. The city is home to the Pimlico and Aitkenvale campuses of TAFE Queensland North — a Technical and Further Education College, a campus of Queensland Agricultural Training Colleges, and Tec-NQ. The Australian Festival of Chamber Music is an international chamber music festival held over ten days each July in Townsville. The festival has been running since 1991, and attracts many acclaimed international and Australian musicians. Townsville also has its own orchestra, the Barrier Reef Orchestra, which presents concerts throughout North Queensland. The Townsville Entertainment Centre, seating more than 5,000 people, is host to many national and international music shows, as well as sporting and trade shows. The region has many renowned festivals, many which celebrate the international heritage of many that call North Queensland home. The Annual Greek and Italian Festivals are popular with the locals and tourists alike. The Townsville South hotel and restaurant strip hosts an annual Palmer Street Jazz Festival, as does nearby Magnetic Island (The Great Tropical Jazz Party). The Stable on the Strand is celebrated each Christmas. The Townsville Civic Theatre is North Queensland's premier cultural facility. Since its opening in 1978, the Theatre has been a centre of entertainment and performing arts, providing an environment to further develop the performing arts in Townsville and the North. The Full Throttle Theatre Company is a professional theatre company based in Townsville. Full Throttle showcases the talents of local actors, designers, directors and playwrights. It presents four major shows a year. The Perc Tucker Regional Gallery is the public art gallery of Townsville. Located on the eastern end of Flinders Mall, the Gallery focuses on artwork relevant to North Queensland and the Tropics. Every second September the gallery presents sculpture artworks and art festival called Strand Ephemera, exhibited over the two kilometre beachfront strip. The Townsville City Council and Townsville Intercultural Centre annually organises Cultural Fest in mid August. The festival has been held in various locations across the city over its history, and is currently held on the grounds of James Cook University. The Cultural Fest showcases the cultural diversity of the city and dance, food, and music from different ethnic groups in the region. The city has several museums. The Maritime Museum of Townsville, also known as the Townsville Maritime Museum, is located as part of the Port of Townsville. Its features include HMAS Townsville, SS Yongala, and lenses from current and former lighthouses. The Museum of Tropical Queensland (abbreviated MTQ) is a museum of natural history, archaeology and history. In addition to housing artifacts from the wrecks, the museum administers the shipwreck sites for HMS Pandora and SS Yongala. The city has many restaurants, concentrated on Palmer Street in South Townsville, Flinders Street and to a lesser extent along the Strand. The city also has a vibrant pub and night-club scene, many of them located in Flinders Street East. Townsville is the media centre for North Queensland, with four commercial and five narrowcast radio stations, North Queensland ABC radio station, three commercial television stations, one regional daily newspaper and one community weekly newspaper (both owned by News Ltd). There are no local Sunday papers although The Sunday Mail (Qld) — based in Brisbane — does have a North Queensland edition. Media distributed on the World Wide Web include the Townsville Bulletin. One of Riverway's swimming lagoons, a free swimming and recreation area. Townsville hosts several sporting teams that participate in national competitions. These include the North Queensland Cowboys (National Rugby League), and the Townsville Fire (Women's National Basketball League) who play at the Townsville RSL Stadium. The city also formerly hosted the Townsville Crocodiles, (National Basketball League) who played out of the Townsville Entertainment Centre, known as The Swamp during Crocs home games. Townsville also hosts two Touch Football associations. The Townsville/Castle Hill Touch Association (TCHTA) conducts competitions annually at its grounds at Queens Park, Townsville. Thuringowa Touch Association (TTA) also conducts competitions at Greenwood Park, Kirwan. Both competitions have produced a host of regional, state and national representative players and officials. Townsville and its surrounding suburbs host a number of junior and senior rugby league sides in the successful , including A-grade sides: Bindal Sharks, Brothers Townsville, University Saints and Centrals ASA Tigers. The junior league has produced a number of Australian internationals such as Gorden Tallis and Gene Miles. Townsville and District Rugby Union run a successful Winter Junior and Senior Rugby Union competition including teams from Ingham, Charters Towers and Ayr. Townsville has produced a number of Wallabies in past including Peter Grigg and Sam Scott-Young. AFL Townsville operate a regional Australian rules football league in the region. Jake Spencer is the first local player to play in the AFL. Several Australian Test and ODI cricketers have come out of Townsville including fast bowler Mitchell Johnson, Andrew Symonds and James Hopes. In 2012 Townsville hosted under 19 cricket World Cup preliminary matches, semi finals and the final featuring Australia and India. The Townsville Street Circuit is located in Reid Park in Townsville. Each July since 2009, it hosts the Townsville 400 for the Supercars Championship. Townsville also has a go cart track and motocross track; Townsville had a 1/4-mile dragstrip, but it closed its gates on 25 August 2012 due to urban development. Rowing occurs at Townsville & JCU Rowing Club and Riverway Rowing Club. Both clubs cater to competitive masters, social, learn to row and school-based rowing programs. In 2009 the Townsville & JCU club won its first Queensland Club Premiership and in 2010 Riverway club claimed theirs. Townsville has 3 Tennis Clubs. The Western Suburbs Tennis Club Inc, Tennis Townsville Inc and Kalynda Chase Tennis Centre. Each year Tennis Townsville host the NQ Open Championships and Western Suburbs Tennis Club host the Townsville Open. These tournaments see Australian and international players competing for up to $10,000 prize money and the opportunity to improve their Australian Tennis Ranking. The Townsville Hospital is a 580-bed university teaching hospital in the suburb of Douglas. The Townsville Hospital was formally located in North Ward whose main building serves an example of the Streamline Moderne style of architecture. It is co-located with the James Cook University School of Medicine. The hospital caters for the city of Townsville, as well as people in the north as far as Thursday Island and Papua New Guinea, west to Mount Isa and south to Sarina. During the year 2010, the hospital admitted 54,941 patients, and had 60,676 presentations to the emergency department. The hospital is also the major tertiary maternity centre, with 2,308 babies delivered in 2010. The Townsville Hospital underwent a $437 million redevelopment as of 2011, delivering an additional 100 beds, a four-storey expanded Emergency Department, expanded Neonatal Intensive Care Unit, and expansion of oncology services. The Emergency Department will be the largest in Queensland. There are four other public health campuses in Townsville: the Kirwan Health Campus, the Magnetic Island Health Service Centre, the North Ward Health Campus and the Townsville Hospital Dentist, located in North Ward. In addition there are two private hospitals in Townsville, the Mater Hospital and the Mater Women's and Children's Hospital. Townsville is the intersection point of the A1 (Bruce Highway), and the A6 (Flinders Highway) National Highways. The Townsville Ring Road, planned to become part of the re-routed A1 route bypass, circumnavigates the city. Townsville has a public transport system contracted to Sunbus Townsville, which provides regular services between many parts of the city. Public transport is also available from the CBD to Bushland Beach. Regular ferry and vehicular barge services operate to Magnetic Island and Palm Island. The Tilt Train service connects Townsville railway station to Brisbane in the south and Cairns in the north. Townsville is a major destination and generator of rail freight services. The North Coast railway line, operated by Queensland Rail, meets the Western line in the city's south. Container operations are also common and the products of the local nickel and copper refineries, as well as minerals from the western line (Mount Isa), are transported to the port via trains. The Port of Townsville has bulk handling facilities for importing cement, nickel ore and fuel, and for exporting sugar and products from North Queensland's mines. The port has three sugar-storage sheds, with the newest being the largest under-cover storage area in Australia. The city is served by Townsville International Airport. The Airport handles direct domestic flights to Darwin, Brisbane, Sydney, Melbourne, as well as direct regional flights to destinations such as Cairns, Mount Isa, Rockhampton and Mackay. Airlines currently servicing the airport include Qantas, Virgin Australia, Jetstar, Tigerair Australia, Regional Express, Qantaslink, Airnorth and Skytrans. In 2015, Jetstar began regular international flights from Townsville to Denpasar, Bali. The Australian Army maintains a very strong presence in the north of Australia and this is evident by the basing of the Army's 3rd Brigade at Lavarack Barracks in Townsville. The 3rd Brigade is a light infantry brigade. The brigade consists of three light infantry battalions — the 1st, 2nd and 3rd Battalions of the Royal Australian Regiment (1, 2 and 3 RAR) — and a cavalry contingent — the 2nd Cavalry Regiment. It also has integral Artillery, Engineer, Aviation Reconnaissance and Combat Service Support units. It is a high-readiness brigade that has been deployed frequently at very short notice on combat operations outside mainland Australia. These include Somalia, Rwanda, Namibia, East Timor, Bougainville, Solomon Islands, Iraq and Afghanistan. In addition to the 3rd Brigade, a number of other major units are based in Townsville. These include the 5th Aviation Regiment, equipped with MRH-90 and Chinook helicopters, co-located at the RAAF Base in Garbutt and the 10th Force Support Battalion based at Ross Island. 10 FSB is a force logistics unit that provides back up logistic support to deployed units. The battalion provides specialist transport (including amphibious) and supply support. Along with this there is also the 11th Combat Service Support Battalion and the 3rd Combat Engineer Regiment. The Army also maintains an Army Reserve brigade in Townsville designated the 11th Brigade. This formation is similar in structure to the 3rd Brigade but comprises reserve soldiers only. There is also two active cadet units, 130 ACU located within Heatley Secondary College and 15 ACU located on Lavarack Barracks as of 2010, previously located at Ignatius Park College. As with the Army, the Royal Australian Air Force also maintains a presence in Townsville. RAAF Base Townsville, which is located in the suburb of Garbutt, houses the Beech KingAir 350 aircraft from No. 38 Squadron RAAF. This unit operated the venerable DHC-4 Caribou aircraft until late 2009; however, it has re-equipped in the short term while protracted analysis for a more appropriate Battlefield Transport and Utility aircraft continues. This detachment provides support to the Army units in Townsville. The base is also a high readiness Defence asset and is prepared to accept the full range of RAAF aircraft types as well as other international aircraft including the huge C-17 Globemaster III and the Ukrainian Antonov transport aircraft. Townsville is also the staging point for the movement of personnel and materials to the remote parts of Northern Australia and many overseas locations. The Australian Navy's two Canberra-class landing helicopter dock ships visit Townsville frequently to exercise with the 3rd Brigade and other troops and formations from the area and deploy them when tasked. The Townsville branch of the Queensland Country Women's Association meets at the CWA Hall at 36 Latchford Street, Pimlico. Ralph Douglas Kenneth Reye (1912–1977), Australian pathologist who first described Reye's syndrome. ^ a b Australian Bureau of Statistics (27 June 2017). "Townsville". 2016 Census QuickStats. Retrieved 15 August 2018. ^ Australian Bureau of Statistics (27 June 2017). "2016 Community Profiles: Townsville". 2016 Census of Population and Housing. Retrieved 15 August 2018. ^ a b c d e f g "Climate statistics for Townsville". Bureau of Meteorology. Archived from the original on 5 December 2016. Retrieved 11 December 2016. ^ "Townsville". Queensland Government. Department of Environment and Resource Management. 3 February 2009. Archived from the original on 1 September 2009. Retrieved 20 September 2009. ^ "Schedule 1: Regional overviews" (PDF). Queensland Government. Environmental Protection Agency: 13. Archived from the original (PDF) on 10 August 2008. Retrieved 20 September 2009. ^ "Vincent". Queensland Government. Department of Housing. 14 September 2004. Archived from the original on 13 September 2009. Retrieved 20 September 2009. ^ Trood, Russell. "Town profiles: Townsville". Liberal National Party of Queensland. Archived from the original on 13 September 2009. Retrieved 20 September 2009. ^ "Wulgurukaba to claim for Townsville". Magnetic Times. 20 May 2005. Archived from the original on 6 July 2005. Retrieved 20 September 2009. ^ a b c d e f g h "A Chronological History of Townsville 1770 to 1900". Townsville City Council. 2 November 2008. Archived from the original on 20 February 2011. Retrieved 20 September 2009. ^ a b c "Birth of Our Nation: The height of determination". Courier Mail. 2001. Archived from the original on 27 July 2008. Retrieved 20 September 2009. ^ Kennedy, Edward (1902). The Black Police of Queensland. London: John Murray. pp. 101–126. ^ "A Chronological History of Townsville 1901 to 1969". Townsville City Council. 2 November 2008. Archived from the original on 29 September 2009. Retrieved 20 September 2009. ^ "TOWNSVILLE SOLDIERS' MEMORIAL". The Brisbane Courier. National Library of Australia. 21 July 1923. p. 9. Retrieved 6 April 2014. ^ "THE SOLDIERS MEMORIAL". Townsville Daily Bulletin. Qld. : National Library of Australia. 26 April 1924. p. 4. Retrieved 6 April 2014. ^ "Townsville Cenotaph". Monument Australia. Archived from the original on 7 April 2014. Retrieved 5 April 2014. ^ a b Thuringowa City Council (15 November 2004). "History of Thuringowa". Archived from the original on 18 September 2006. Retrieved 14 December 2006. ^ a b "in repose". Mayu Kanamori. Archived from the original on 30 August 2007. Retrieved 20 September 2009. ^ Bavas, Josh (10 February 2012). "Townsville WW2 Mutiny Uncovered by Queensland Historian". Australian Broadcasting Corporation. Archived from the original on 27 October 2015. Retrieved 27 October 2015. ^ "Air raids on Australian mainland — Second World War". Australian War Memorial. Archived from the original on 8 October 2009. Retrieved 20 September 2009. ^ Dunn, Peter (2004). "The Japs bomb Townsville, Queensland during WW2". Australia @ War. Archived from the original on 21 September 2009. Retrieved 20 September 2009. ^ Gillison, Douglas (1962). History of Australia in the War of 1939–1945. Series 3 — Air. Volume I — Royal Australian Air Force, 1939–1942. Canberra: Australian War Memorial. pp. 562–563. Archived from the original on 14 June 2006. ^ "Black Community School". Screen Australia Digital Learning. Archived from the original on 10 April 2018. Retrieved 27 November 2018. ^ Created by Thomas Rickard (2 November 2008). "We Are No Longer Shadows". First Australians. Australia. 13:45 minutes in. SBS. SBS. Archived from the original on 27 September 2010. ^ Reynolds, Henry (1992). The Law of the Land (2 ed.). Ringwood, Vic: Penguin. pp. 185–186. ^ "Keon-Cohen, B.A. (2000) "The Mabo Litigation: A Personal and Procedural Account" Melbourne University Law Review 24(3)". Archived from the original on 16 May 2011. Retrieved 1 February 2011. ^ "About Bryan Keon-Cohen". Archived from the original on 10 June 2015. Retrieved 17 June 2015. ^ "You're part of the family, Mabo clan tells lawyer who led landmark case". Sydney Morning Herald. 4 June 2012. Archived from the original on 24 September 2015. ^ "Eddie Mabo Library to open at Townsville's James Cook University". The Australian. 21 May 2008. ^ Mabo v Queensland (No 2)  HCA 23, (1992) 175 CLR 1 (3 June 1992), High Court. ^ "Praise for International Peace Team in Solomon Islands" (Press release). Australian Minister for Foreign Affairs. 25 June 2002. Archived from the original on 20 September 2009. Retrieved 20 September 2009. ^ Raggatt, Tony (25 April 2008). "Townsville's billion-dollar suburb". The Townsville Bulletin. Townsville. Archived from the original on 31 July 2008. Retrieved 20 September 2009. ^ "Mountain ranges inspire newly named master planned community – Elliot Springs" (PDF). Lendlease. 25 January 2017. Archived from the original on 3 December 2017. Retrieved 1 July 2017. ^ O'Reilly, Jennifer (24 June 2008). "New Townsville suburb planned for Bohle". The Townsville Bulletin. Townsville. Archived from the original on 31 July 2008. Retrieved 20 September 2009. ^ Townsville City Council (March 2016). "Townsville Community Profiles Division 3" (PDF). p. 5. Archived (PDF) from the original on 30 March 2018. Retrieved 6 May 2018. ^ a b c "Climate of Townsville". Bureau of Meteorology. Archived from the original on 5 October 2017. Retrieved 5 October 2017. ^ Dewar, Robert E; Wallis, James R (1999). "Geographical patterning of interannual rainfall variability in the tropics and near tropics: An L-moments approach". Journal of Climate. 12 (12): 3457–3466. Bibcode:1999JCli...12.3457D. doi:10.1175/1520-0442(1999)012<3457:GPOIRV>2.0.CO;2. ^ Parkes, Kevin. "Submission to Queensland Floods Commission of Enquiry" (PDF). Queensland Government. Retrieved 8 April 2014. ^ "2016 Townsville City Council Mayoral / Councillor Election : 19 March 2016". Electoral Commission of Queensland. 19 March 2016. Archived from the original on 12 May 2016. Retrieved 18 June 2016. ^ a b Templeton, Anthony (4 May 2012). "Hill ready to take over reins of city". Townsville Bulletin. Archived from the original on 20 May 2012. Retrieved 27 June 2012. ^ "2012 Townsville City Council – Mayoral Election – Election Summary". Electoral Commission of Queensland. 28 May 2012. Archived from the original on 8 May 2016. Retrieved 18 June 2016. ^ "2016 Townsville City Council – Mayoral Election – Election Summary". Electoral Commission of Queensland. 20 April 2016. Archived from the original on 14 June 2016. Retrieved 18 June 2016. ^ "Townsville battery "gigafactory" plan gains momentum". Renew Economy. 23 April 2018. Retrieved 28 August 2018. ^ "Queensland Charges ahead with Townsville battery project". Queensland State Government. 23 August 2018. Retrieved 28 August 2018. ^ "Economic Impact of Proposed Sun Metals Expansion - Property Friends". www.propertyfriends.com.au. Retrieved 2018-11-13. ^ "Population projections: Queensland's future population 2008". Queensland Government. Department of Infrastructure and Planning. 4 March 2009. Archived from the original on 4 June 2009. Retrieved 10 June 2009. ^ "Townsville Chamber of Commerce Yearbook 2006" (PDF). Archived from the original (PDF) on 29 August 2007. Retrieved 28 December 2006. ^ Healy, Samantha (31 March 2016). "Call for action on 1pc growth". Townsville Bulletin. News Corp Australia. Archived from the original on 31 March 2017. Retrieved 26 April 2016. ^ "Regional Population Growth, Australia". Australian Government. Australian Bureau of Statistics. 23 February 2006. Archived from the original on 6 September 2006. Retrieved 17 January 2007. ^ "Townsville Grammar School Prospectus" (PDF). Townsville Grammar School: 5. Archived from the original (PDF) on 13 September 2009. Retrieved 20 September 2009. ^ "JCU Background". Archived from the original on 9 October 2007. Retrieved 17 October 2007. ^ School of Marine and Tropical Biology Archived 6 January 2009 at the Wayback Machine, James Cook University. Retrieved on 18 August 2011. ^ "Townsville now a 2-Uni city and Charters Towers welcomes new Study Hub". CQUniversity. 12 September 2014. Archived from the original on 4 April 2018. Retrieved 4 April 2018. ^ "Townsville". TAFE Queensland North. Archived from the original on 19 May 2017. Retrieved 21 May 2017. ^ "Tec-NQ". Tec-NQ. Archived from the original on 26 May 2017. Retrieved 21 May 2017. ^ Australian Festival of Chamber Music Official Webpage Archived 12 October 2009 at the Wayback Machine. Afcm.com.au. Retrieved on 18 August 2011. ^ "Full Throttle Theatre Company official website". Archived from the original on 26 April 2010. Retrieved 6 January 2007. ^ "Townsville City Council — Strand Ephermera". Archived from the original on 2 March 2007. Retrieved 3 April 2007. ^ Rowlett, Russ. "Lighthouses of Australia: Queensland's East Coast". The Lighthouse Directory. University of North Carolina at Chapel Hill. Retrieved 2011-12-27. "...the Townsville Maritime Museum...exhibits a collection of Fresnel lenses from the former...Albino Rock...lighthouses." ^ a b 1300SMILES Stadium Archived 4 October 2012 at the Wayback Machine. Austadiums.com. Retrieved on 25 April 2013. ^ "Townsville". Gold Coast 2018 Commonwealth Games Corporation. Retrieved 2 August 2018. ^ SportingPulse Homepage for Townsville Castle Hill Touch Association Archived 10 February 2009 at the Wayback Machine. Sportingpulse.com. Retrieved on 18 August 2011. ^ Thuringowa Touch Association Archived 25 April 2012 at the Wayback Machine. ThuringowaTouch.com. Retrieved on 18 October 2011. ^ Courier Mail: Townsville's Jake Spencer set for debut with Demons Archived 30 March 2009 at the Wayback Machine. News.com.au (19 February 2009). Retrieved on 18 August 2011. ^ "Queensland Club Premiership - Rowing Queensland - revolutioniseSPORT". www.rowingqld.asn.au. ^ a b Queensland Government: Townsville Hospital Archived 29 March 2011 at the Wayback Machine. Healthier.qld.gov.au (19 May 2011). Retrieved on 18 August 2011. ^ Queensland Health: The Townsville Health Service District Redevelopment Archived 30 March 2011 at the Wayback Machine. Health.qld.gov.au. Retrieved on 18 August 2011. ^ Kirwan Health Campus Archived 20 February 2007 at the Wayback Machine. Health.qld.gov.au (21 April 2006). Retrieved on 18 August 2011. ^ Magnetic Island Health Service Centre Archived 18 February 2007 at the Wayback Machine. Health.qld.gov.au (4 November 2008). Retrieved on 18 August 2011. ^ North Ward Health Campus Archived 20 February 2007 at the Wayback Machine. Health.qld.gov.au (21 April 2006). Retrieved on 18 August 2011. ^ Townsville's Hermit Park Bus Service Archived 18 June 2012 at the Wayback Machine. Hpbs.com.au (1 April 2010). Retrieved on 18 August 2011. ^ Fantasea Official Website: Magnetic Island Timetable Archived 12 September 2009 at the Wayback Machine. Fantaseacruisingmagnetic.com.au. Retrieved on 18 August 2011. ^ Building and Structures Archived 6 July 2014 at the Wayback Machine. (23 March 2009). Retrieved on 16 October 2012. ^ Townsville Airport Homepage Archived 26 October 2005 at the Wayback Machine. Townsvilleairport.com.au. Retrieved on 18 August 2011. ^ Home Page — 3rd Brigade Community — Forces Command Archived 21 November 2008 at the Wayback Machine. Armyintownsville.net. Retrieved on 18 August 2011. ^ Forces Command — 3rd Brigade Community: Units that Support 3 Bdef Archived 8 October 2009 at the Wayback Machine. Defence.gov.au (4 August 2011). Retrieved on 18 August 2011. ^ "RAAF Base Townsville". Royal Australian Air Force. Archived from the original on 3 May 2013. Retrieved 30 December 2015. ^ Informit — Engineering Conference Darwin: Developing Remote Areas; Printed Papers — Development of Air Transport Facilities in Remote Areas (Engineering Collection). Search.informit.com.au. Retrieved on 18 August 2011. ^ "Sister Cities". City of Townsville. Retrieved 23 October 2018. ^ Matheson, Ryan (29 December 2011). "Bannister's Olympic dreams on hold". Townsville Bulletin. Archived from the original on 3 July 2013. Retrieved 13 February 2012. ^ Greg Norman's official website: Norman Takes State Junior Golf Title Archived 16 July 2011 at the Wayback Machine. Shark.com (17 December 1972). Retrieved on 18 August 2011. ^ Greg Norman's official website: Reef Love — Adventures along Australia's Great Barrier Reef Archived 18 May 2011 at the Wayback Machine. Shark.com. Retrieved on 18 August 2011. ^ "Wikileaks founder Julian Assange a born and bred Queenslander". The Courier-Mail. News Limited. 29 July 2010. Archived from the original on 18 April 2012. Retrieved 13 February 2012. ^ Kennedy, Chris; Brady, Jack (2 October 2015). "Celebrity poll: Who will win the GF?". NRL.com. Archived from the original on 2 October 2015. Retrieved 2 October 2015. ^ Byrnes, Holly (7 May 2012). "Ben Bennett, 17, of Sydney for Team Delta on The Voice". The Daily Telegraph. ^ Artist's creations tour Italian cities |Townsville Bulletin News Archived 2 March 2011 at the Wayback Machine. Townsvillebulletin.com.au (17 February 2011). Retrieved on 18 August 2011. ^ Australian Dictionary of Biography: Reye, Ralph Douglas Kenneth (1912–1977) Archived 19 June 2009 at the Wayback Machine. Adb.online.anu.edu.au. Retrieved on 18 August 2011. ^ Allmovies: Madge Ryan Archived 6 February 2010 at the Wayback Machine. Allmovie.com. Retrieved on 18 August 2011.